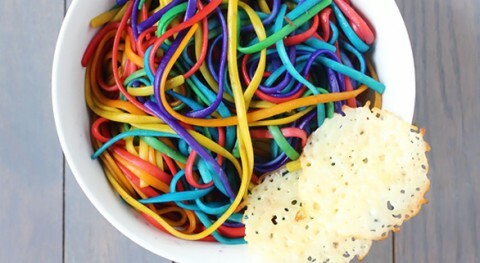 I know for a fact that my kids would get a total kick out of these Rainbow Spaghetti. Yes, food coloring is bad for you. I get that. Obviously, I wouldn’t feed these to my kids daily. Looks like the product of a cool mum, to me. Go the coloured spaghetti, and worry about Coke and KFC instead. I really don’t get it. If you know food coloring is bad for you, why would you ever feed it to your kids. Not telling you what to do, just really can’t understand. Hi dear swiss miss, don’t worry about food colorings and use fun colored food instead. Homemade pasta is easy and fun to do with kids. You just need two or three ingredients: flour, eggs, salt. Check out Jamie Oliver’s recipes. If you are adding any of the above, remove one egg. It’s super fun to do and tastes delicious. Best regards, you are an (almost daily) inspiration. You don’t really get that intensive color in your homemade pasta with spinach or beetroot, I have tried it! I myself would not eat those rainbow spaghetti, they just don’t look appetizing to me, but small children might think otherwise. Maybe I try it out with my grandson once he is back from a 2-month-journey. I especially love the idea ! It is a treat, and kids have been eating colored cereals for years, sometimes every day- aka fruit loops, these cereals are non toxic to a certain extent, except the sugar. Parmesan crisps on the side ? Cheers.